A Hovland year-round vacation rental home with amazing views. Large glass windows from all angles give you a view of Lake Superior`s coastline. Heaven Sent is not only the name but the experience you will have at this Lake Superior home. Deck offers outside seating and viewing. Enough room in this living area for everyone to be comfortable. Cozy up after hiking in front of this beautiful stone fireplace and flatscreen TV. Feels like you are on the water in this open living space. Open gourmet kitchen with space for everyone to help out. Kitchen equipped with full size appliances. No need to waste time doing dishes by hand with this dishwasher. Dining table seats up to 8. Dining at its best, with incredible Lake Superior views. Open spaces for all to enjoy each others` company. Second level provides the perfect space for that afternoon nap in front of this wood stove. Wake up to Lake Superior out your bedroom window in this master bedroom. Queen size poster bed in master bedroom. Queen size bed in this upper level makes for a good nights sleep. Queen size bed in this bedroom. Open the windows and hear the waves of Lake Superior. Bathroom 1 equipped with full size tub. Bathroom 2 has walk-in tiled shower. Washer / Dryer for guests` use. What a view Read a book or just take it all in. Plenty of Lake Superior boats cross by this body of water. Beautiful sitting area to play a game of cards or enjoy after dinner conversation. Game room provided for guests` entertainment. Foosball for everyone. Enjoy morning coffee on this amazing deck. Deck views from all angles. Breakfast on the deck, seating provided. Watch the waves crash against the rocks. Take a stroll down to the water. View of Heaven Sent from Lake Superior shoreline. Plenty of room outside for a walk around the property. Back of house with parking for guests. Aptly named, Heaven Sent is a spectacular vacation rental destination in Hovland. Gorgeous views, total privacy, 360 feet of ledge rock shoreline, 4 acres, and 2 decks are among its assets. The property has a 46-inch flat screen t.v., pool table, 3 bedrooms, 2 baths, a large dining area for 8, gorgeous wood flooring, and a garage. You will be taken in by the unique architecture and amazing views that this home has to offer. With floor to ceiling windows, you can take in the beauty of Lake Superior from most rooms. Two fireplaces also add to the warmth and ambiance of this gorgeous home. If you are up for an adventure you will have plenty to find just a short drive away! Head to Judge CR Magney State Park. Enjoy a challenging 1-mile hike to the infamous Devil's Kettle. High Falls and the Canadian Border are also just a few miles away and a great location for hiking. You will find the home surrounded by miles of mountain biking trails and cross-country ski trails in the winter. You are also just a 20-minute drive away from Grand Marais, home to many locally owned and operated shops and restaurants. Chicago Bay Deli and Naniboujou Restaurant are convenient stops to eat just a few miles from the home, and Heaven Sent is near the Horseshoe Bay boat launch. Whether your vacation goals on the North Shore are to have an adventure or simply come to unwind and relax, Heaven Sent is a vacation destination that can deliver both. 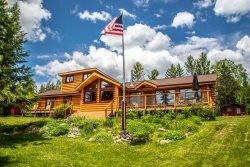 So make this your home away from home for your next north woods vacation! Dogs under 30 lbs are welcome with prior approval. 2 dog maximum. Sorry, no cats or large breed dogs. Awesome. Awesome. Awesome. Terrific view of the lake, secluded, peaceful, and quiet. There were many private nooks in the home where you could relax alone and an absolutely amazing wood burning fireplace. Most areas of the home had thermostats so you could control the temperature in those areas--cooler in the bedrooms, warmer in the bathrooms and living areas. Simply incredible!